Among the many natural assets of Romania, Slănic Prahova, the beautiful resort of Prahova county, attracts thousands of tourists all the time, irrespective of the seasons, and this is mainly due to the ancient salt mine, this unique place that is, at the same time, a sanatorium, a museum and … as we are about to discover, a place to fly in. Two large halls have made the renown of the mine: “Mihai”, situated at about 140 meters under the ground, and “Unirea”, which is at 208 meters of depths. Both halls (or mines) have become interesting for tourists, who are eager to see the mines and the many statues made in salt and representing personalities of the Romanian history and culture; and, last but not least, for people sick with asthma, those who are looking for a medical cure down there. Well, for adventurous people, the salt mine is not just a place for sightseeing, but also, or mainly, a place where they can do what they love most. Some people climb on the salt walls, but others fly there, in those narrow corridors. Yeah, fly, as the two halls of the mine are suitable (and they say this is the only place of this kind in Europe) for flying this special kind of aircraft that is a paramotor (powered paraglider). A few years ago, Felix Baumgartner, an Austrian skydiver, dove from a balloon flying at 39,045 km and established a tremendous record. Our fiends, Adrian Buzan and Ionuţ Riteş, did the opposite: they flew, in 2011, inside the planet, in the „Mihai” hall, at 140 meters of depth. So they established a record of their own, which is acknowledged by the World Records Academy. But, as we all know, every record is meant to be broken, sooner or later. 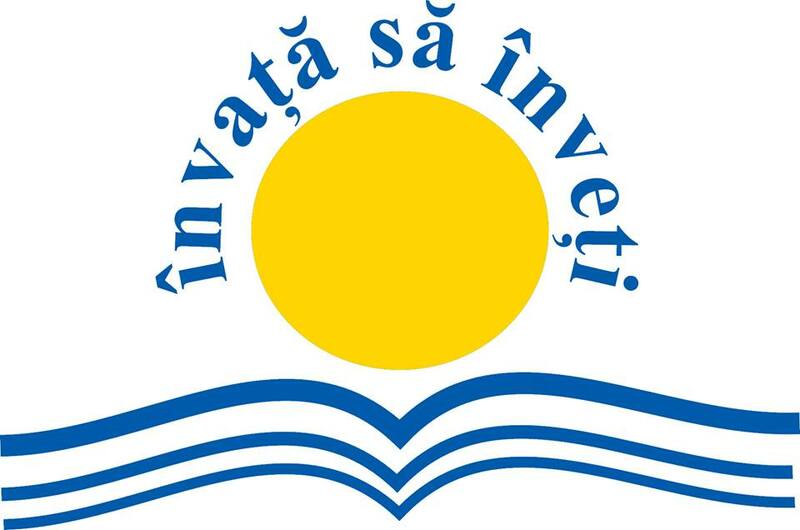 Adi, who first had the idea to fly in the mine in 2011, and Ionuţ decided to go for a new record, which meant to fly in another hall, „Unirea”, which is even deeper than „Mihai”. 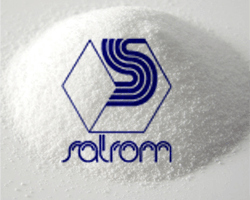 They requested and obtained all the necessary approvals from the owner of the mine, the National Company of the Salt SALROM, which proves the openness of the company managers and, on March 22nd 2016 they travelled, by minibus, to center of the Earth. Aboard the car they took their equipment, that is the two paramotors and all they thought it was necessary for a good flight. About 30 other people accompanied the two sportsmen in the mine: officials of the Salt Company and of the “Learn how to Learn” Foundation, members of the Association “The Applied Strategies Centre” and those of the Sport Association “Phoenix Club 89”, who have decided to support them, engineers and the press. First things first. The pilots had to make a reconnaissance of the circuit. The “Unirea “hall is rectangular, a kind of a corridor going round a central poll that has not been carved (and will not be) for reasons of security. The flight was going to take place around this poll, on a 750 meters long circuit (125 m x 110 m). The longer the flight, the most important the record. They are planning seven laps, meaning more than 5 kilometrers. In order to insure the safety of the flight, all the measures had been taken. It was a Tuesday, when no visitors are allowed in the mine (Tuesdays are usually reserved for technical revisions). The electricians of the mine have removed all the lamps from the ceiling – those lamps are hanging on an electric lead and on common days enlighten the visitors’ tour of the cave, but now, if one of the lamps touched the canopy of the paramotor an accident could occur; they have no room for turning around any obstacle, the corridors are only 35 meters wide and 55 meters high. Next, the pilots marked their way, using small candles set on the floor. Hundreds of candles were placed on the corridor and lighted, so that the two paramotorists could find their way in the dark. The aircraft were finally set and the pilots put them on their back. They calculated a safety distance of about 200 meters between them, and this gap should be observed for the entire time of the flight, which meant that they had to fly at the same speed. No communication was possible between the two men, not even at sight, but they are confident. Both paramotors belong to the same class, the pilots are extremely well trained, everything had to go as planned. Clear for takeoff. They start at the same time and as they are airborne; two records are already broken: two pilots fly at the same time in this deep mine, 208 meters under the ground. The audience cheer, but they don’t have the leisure to be happy yet. A few laps have to be completed before they land and shake hands. Everything goes well. The aircraft work fine, the pilots fly at a speed of 30 km/h and nothing comes to disturb them. No air stream, no sudden obstacle, no physical or mechanical failure. The canopies slide smoothly at a small distance from the walls, the turns are takes cautiously, because, if it weren’t so, the fabric of the canopy may touch the salt wall and tear off, and that would be a terrible accident. Flight is freedom, it has always been. Adrian feels free, even if he is now flying underground, in such an unusual closed space, like a butterfly in a jar. The time passes by; the 5 kilometers are covered in 7 laps and the two happy men land, at last. Ionuţ is grateful to the divinity: he is sure that their success is also due to their guardian angels, who have been permitted to accompany them there, below the ground. He had felt safe and great, like flying in a cathedral. They are welcomed by their friends and a bottle of champagne explodes to celebrate the achievement: Adrian Buzan and Ionuţ Riteş have set a new World Record: two pilots have flown, at the same time, in an underground circuit at – 208 m; they have covered this very long distance of 5,236 kilometers, being airborne for about twelve minutes. 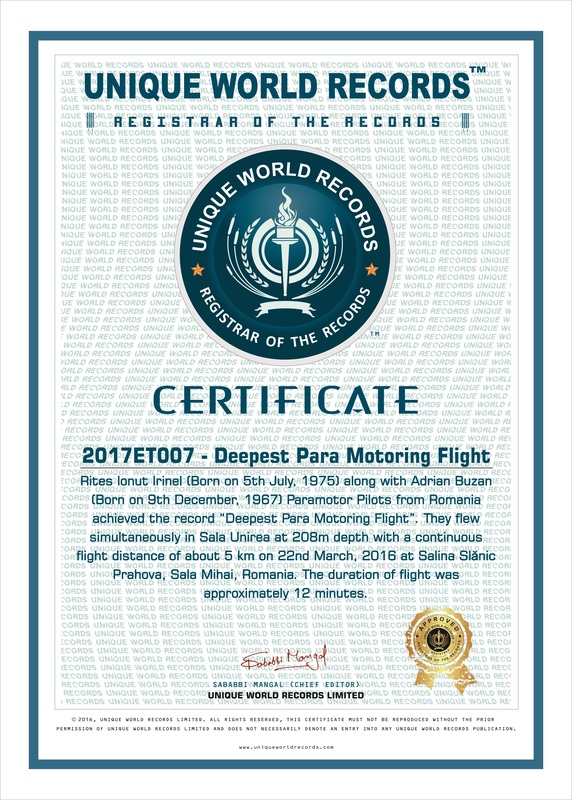 This new record in the domain of aviation has been obtained by two Romanian pilots, for Romania! A long history of records, starting more than one hundred years ago is now completed by our two friends. And, as this salt mine is kind of unique in the world, the record is not likely to be beaten soon! What a beautiful work of propaganda for the Romanian aviation, what a great promotion for the natural riches and beauties of Romania! Thank you, guys! Now, that is has been proved that flight is possible in the salt mine from Slănic Prahova, it is time to make plans. Plans for future records, plans for future competitions. Speed could be increased in the mine, more pilots could fly there. Ionuţ Riteş is already thinking of an open speed competition, where the best and the most courageous pilots from Romania and Europe could participate. The aircraft should be very rapid ones, able to reach a speed of about 70 to 90 km/h. More interesting and more dangerous than a Formula One race, evaluated at a risk of 7-8 on a scale of 10! Well, good luck! It will be a new kind of record, beaten by many sportsmen, and this will happen in Romania. Adrian Buzan (born 09.12.1967), Master of Sports, is a parachute jumper and paramotor pilot, holder of many world records omologated by the World Records Academy. He is the President of the Sport Association “Phoenix Club 89”. Ionut Riteş (born 05.07.1975), Master of Sports, is also a parachute jumper and paramotor pilot, holder of several world records. He works as a coach of paramotor club at CS West University of Timișoara. He is the President of the “The Applied Strategies Centre”.